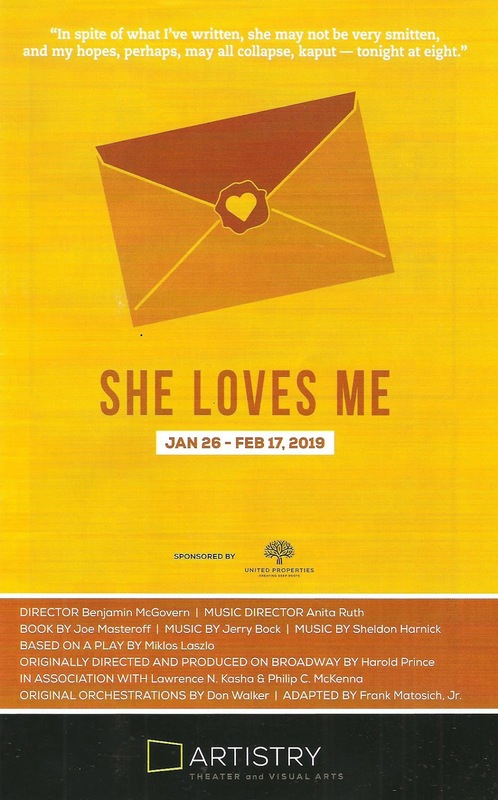 This was my third time seeing She Loves Me in under a year, and I'm not mad about it. Yes, I would prefer that the people of #TCTheater talk to each other a little more so as not to produce duplicate shows, but it happens (e.g., everyone jumping on the Ordway's bandwagon - the Guthrie producing West Side Story the year after they did, the same for Chanhassen Dinner Theatres and Mamma Mia!). If there's a musical I have to see three times in a year (OK I don't have to, I choose to, because I'm me), I'm glad it's this darling little gem of a musical. Each theater (see also Lyric Arts and DalekoArts) brings their own spin to it, and a different delicious cast. 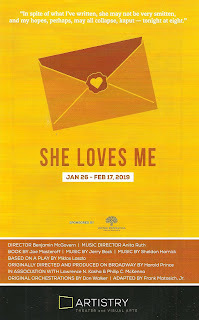 Now playing at Artistry in Bloomington, She Loves Me is definitely worth a visit, whether or not you've seen it on stage recently, or perhaps one of the other iterations of the 1937 Hungarian play (such as the 1940 Jimmy Stewart movie The Shop Around the Corner or the 1998 Tom Hanks/Meg Ryan remake You've Got Mail or the successful 2016 Broadway revival of She Loves Me broadcast live via BroadwayHD). It's a sweet, funny, charming, and relatively egalitarian love story considering when it was written. The story plays out with a strong 11-person ensemble (even if it skews a bit too young). Soprano Sarah DeYoung is a relative newcomer to the #TCTheater scene whom I'm happy to see again. She's a wonderful Amalia, with an effortlessly perfect voice. Ryan London Levin is a charmer as Georg, including some physical comedy, and the two have a nice chemistry. New to Artistry but definitely not new to #TCTheater, T. Mychael Rambo is a gift to the world (see also his one-person autobiographical cabaret show Present) and makes me wish Mr. Maraczek had more songs to sing. 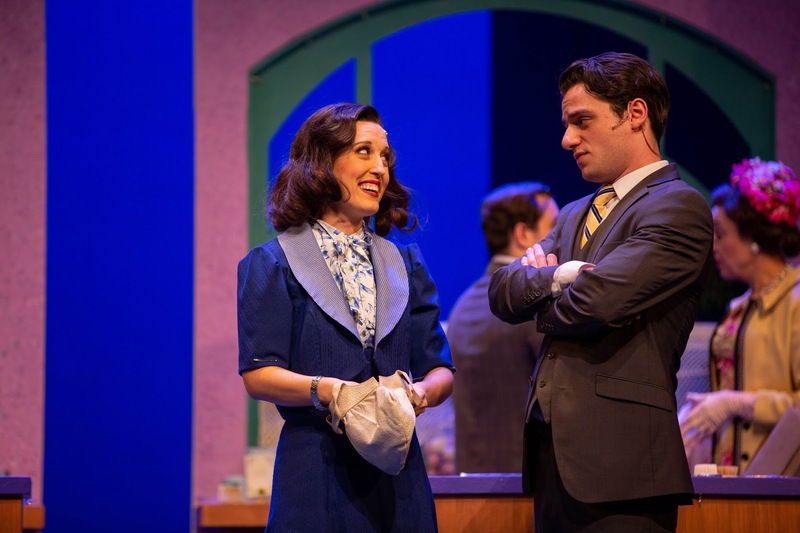 The other featured roles, each with a moment or two to shine, are well played by an effervescent Gracie Anderson as Ilona ("A Trip to the Library"), a smooth Benjamin Dutcher as the womanizer Kodaly ("Ilona"), an exuberant Michael Conroy as clerk-in-training Arpad ("Try Me"), and an elegant C. Ryan Shipley as the pragmatic clerk Sipos ("Perspective"). 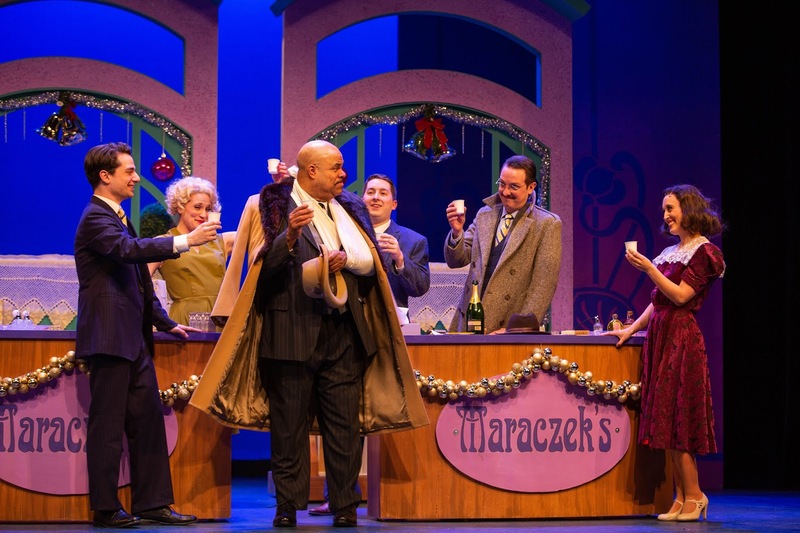 They're supported by a small ensemble playing customers and various other characters, including choreographer Wendy Short-Hays as the ridiculous headwaiter ensuring "A Romantic Atmosphere." The greeting card industry tell us that this is the season of love. If you buy into that, She Loves Me is a wonderful choice to celebrate the season with a funny and charming romantic comedy. Continuing through February 17. *Plot summary borrowed from what I wrote about Lyric Arts' production. Your thoughts about theaters sharing their season plans with one another is an issue that's been discussed within the Community Theaters for a long time, only to be shot down, or greeted with egotistic arrogance. When I was more active in it, there were 5 Charlie Browns produced in a season; I think there were also 5 The Rainmakers? While Donny Osmond sold out the State Theater in Joseph, there were 6 other productions around the Twin Cities. One year, my theater group produced a series titled "The Year of the Playwright." We found that if a name like Neil Simon is the biggest thing on the flyer, it brings audiences in. My wish is to see some of the old classic musicals whose scripts are gathering dust in warehouses. 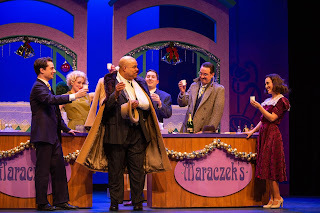 Shows like: Irene, Li'l Abner, Little Me, Allegro, Bells Are Ringing and Mack & Mabel. I expect very few will be done in what's left of my lifetime. We do, indeed, need to have theaters discuss their plans more openly. I saw the Old Log Guys & Dolls last Spring. I doubt I'll bother to see it at the Guthrie. Thanks for letting me share.